Josie and the Emeralds are the acclaimed early music soprano Josie Ryan and some of Australia’s finest viol players: The Emerald City Viols. Founded in 2011, the group is critically acclaimed for its sophisticated performances and innovative programming of Renaissance and contemporary works, including compositions and arrangements by their director, Brooke Green. including The Silver Swan; John Dowland including Flow my Tears and Thomas Morley: Sing we and Chant it. mother – which has been popularly viewed on YouTube; and some delightful piano works by Ross Edwards re-imagined for viol quartet with the new title Miniatures. Josie and the Emeralds thank their many Pozible donors who have given generously to support this CD. Seventeen of the 26 tracks of this interesting CD are composed and/or arranged by the Australian viol-player, Brooke Green (b. 1964). The other nine are songs by Orlando Gibbons, Thomas Morley and John Dowland. Green’s inspiration for “Bone Burning Tunes” (the opening set of four songs) is Crete, a collection of poems by the Australian poetess, Dorothy Featherstone Porter (1954-2008). In the first, called “Music”, a clear, slow-moving melody in 3/4 is played on a treble viol, accompanied by the other viols, now pizzicato, now arco. The treble viol complements Josie Ryan’s clear soprano voice singing: “My decaying lyre glows green under the rubbish mounds/ dumped it lies in wait for someone’s fossicking fingers/ what bone-burning tunes it will play through that stray hand!”. The long melodic lines and discordant harmonies create an unsettling atmosphere, challenging the listener to ponder on the meaning of the words. In “The Emerald Leopard”, the viols create a bustling backdrop with repeated jerky rhythms, while “The Flashing Mountain” is recitative-like, with dramatic pauses. The set ends with a jolly jig-like song, “Hot Date”, with a bass line similar to the opening of The Beatles’ Penny Lane. The five songs by Gibbons are taken from The First Set of Madrigals & Motets (1612) and work well as consort songs. They include a perky “Trust not too much, fair youth” and the evergreen “The Silver Swan”, to which Ryan adds a few of her own divisions and portamento. It is a question of taste, of course, but I like the simplicity of the song, and prefer it unadorned. On the other hand, her divisions in Morley’s “Sing we and Chant it” are a nice touch. The Emeralds have enlisted the help of other musicians, including Jacques Emery, effective on double bass and percussion in Elena Kats-Chermin’s “Eliza Aria”, so it is a pity they make do without a lutenist for the three Dowland songs. “Flow my tears” and “In darkness let me dwell” were composed for voice, lute and bass voice/viol; for the former they adapt the five-part setting in Lachrimae, and for the latter they have presumably made their own arrangement for viols from the lute tablature. Introducing “In darkness let me dwell” in the liner notes, Green refers to Timothie Bright’s Treatise of Melancholy (1586): “gastly fumes of melancholy ... all dark, blacke and full of feare ...”, which could as well refer to “Albanese”. “Sing we and Chant it” and “Flow my tears” must be live performances, because they are followed by inane clapping, which sounds out of place for just these two pieces. Attractive are four Miniatures by Ross Edwards arranged for viols by Green. There are no unpleasant surprises, and the harmonic palette is reassuringly conventional. Soprano Belinda Montgomery joins Ryan to good effect for Green’s “Travelling to the Question”. I’m not sure I understand the words, but I do appreciate the bleak scenario Green creates through her music. It was a pleasure to listen to Green’s “Shades of Presence Past”, having reviewed the music (PRB Productions, Contemporary Consort Series No. 79) for The Viol, Winter 2013-4, No. 33, p. 22. The first movement, “Spirits and Dreams” is an unhurried piece of polyphony, and apart from exploring some strange harmonies, and having a large number of dotted crotchet/quaver rhythms, it is typical viol music, albeit a step or two beyond Lawes and Cranford. The (seven-string) bass player will enjoy the low C#s and the range of nearly three octaves to b’ just above the frets. The piece ends with four minim-rest sighs, and a final scurry to a high note on the treble and tenor 1 viols. “Shades of Shades” sways along nicely, supported by rising arpeggios above a chromatically descending bass line. Sections of 3/4 alternate with sections of 6/8, and the piece slows to a close with an occasional bar of 7/8. In the edition, the jazzy third movement appears as an instrumental piece called “Johnny D’s Jaunt”, but on the CD the top line is sung by Ryan to the words, “My mind to me a kingdom is”. The final movement, “Ghost of Gadget”, is a lively jig, though creepy in mood. It ends with a somewhat shocking chord of A minor – a tierce de Picardie in reverse. I think this suite is fine music, but it needs to be played well, and with conviction, to do it justice. There is one small thing I find irritating: on the back cover of the liner notes is a photo of the four viol-players pretending to play tennis with their viols as rackets. It is not funny, and degrades the instruments and the good things the players are trying to achieve. All in all I find Green’s music evocative, thought-provoking, and entertaining. The group’s viol-playing is excellent – subtly expressive, and playing as one. They fossick well. “Josie” is Josie Ryan, a soprano who trained initially at Sydney Conservatorium, then studied at The Hague Royal Conservatory (on a Dutch Government grant) where she obtained a Masters degree in Early Vocal Music and Historical Performance Practice. She spent a decade in Europe performing with leading groups like The Tallis Scholars, The Amsterdam Baroque Choir and Collegium Vocale Gents. Her beautiful fresh soprano voice is certainly a delight to hear! It is rare to find such a free production throughout the range in this style of singing where minimal vibrato is preferred. Now back in Sydney, she performs regularly with numerous organisations including Pinchgut Opera, The Australian Brandenburg Choir, Cantillation and as soloist with many leading church choirs. “The Emeralds” are the Emerald City Viols, a group directed by Brooke Green (a leading baroque violinist, viol and vielle player, and composer) who has extensive experience leading baroque ensembles and as a treble viol soloist. Her composition, The Shades, won the Audience Prize at the 2013 Leo M. Traynor Tenth International Competition for New Music for Viols. It is included on this disc. Laura Moore, Catherine Upex and Fiona Ziegler make up the rest of the consort and all come with impressive credentials in early music. It is exciting to have such an accomplished group based in Sydney so we too can enjoy the burgeoning interest in early music in live performances, and now on this fine disc. To have such interesting and beautiful works written specifically for viols is also an exciting local development. Dorothy Porter’s poems, audaciously titled Bone Burning Tunes,inspired Green’s four songs for soprano and viols. 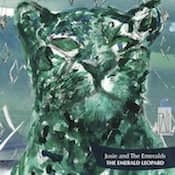 “The Emerald Leopard” is the second song, the inspiration for the disc title and the programming of works. , and the striking CD cover by Paloma Drehs. Brooke Green explains in the CD notes: the leopard is “a grand object of desire” remaining always untouchable, but “we have been transformed by the desire to reach upwards, to approach the beautiful” and “the potential of the Emerald Leopard to transform modes of perception has been a guiding force in putting this cd together”. Bone Burning Tunes are varied in style, though all basically tonal, with lyrical melodies for the voice, and effective and evocative word painting. “Hot Date” provides a sharp contrast to the other three, being a jazzy number with a walking bass and a dark humorous touch (the date being with Death!). Other compositions by Green one can enjoy on the disc are The Shades (the prize-winning piece), Travelling to the Question, Shades of Presence Past and This Body is Not Me. The distinctive mellow tonal qualities of viols and their beautiful blend with their limited dynamic range give these pieces a gentle quality that is most seductive. Often a meditative element was present. Variety to hold the listener’s interest comes with subtle tempo and rhythmic differences and of course the beauty of the soprano’s voice, and the interest of the texts themselves. The beautifulTravelling to the Question has two soprano voices (Ryan and Belinda Montgomery) interweaving gracefully with the strings and uses elements of chant and a melody by Nick Cave (The Carny Song). Also very effective is This Body is Not Me, a song with text about birth and death by Thich Nhat Hanh (b.1926), a renowned Vietnamese Zen Buddhist Monk, teacher, author and poet. Albanese, composed by Andrea Pandolfo (b.1963) and arranged by Green, is a moving lament of a refugee mother and how moving Ryan can be in her performances. Ross Edwards’Miniatures is a charming set of 4 gem-like pieces arranged by Green and her arrangement of “Eliza’s Aria” from Wild Swans by Elena Kats-Chernin is very effective and I enjoyed the flexibility and warmth in Ryan’s voice. I also admired her elegant performances of well-known English Renaissance works such Thomas Morley’s Sing we and Chant It, the three songs of John Dowland (Flow my Tears, In Darkness, Can She Excuse my Wrongs) and the selection of five madrigals of Orlando Gibbons from his 1612 First Set for five voices, which included his renowned The Silver Swan. Flow my Tears is a highlight of the disc –a great song ideally suited to Ryan’s artistry and this recording of a live performance is exquisite in its phrasing. The texts for all works are in the CD booklet along with background information written by Brooke Green that makes for interesting reading. A most enjoyable disc – a wonderful debut CD by this highly skilled group. There must be a thesis explaining how ensembles of ancient Instruments move effortlessly between the pre-baroque and our own times. The Sydney-based ensemble of viols, Josie and the Emeralds, performs works from the Renaissance as well as contemporary Australian works. This delightful debut album assembles a collection of compositions and arrangements by Brooke Green, the group's director and much respected ABC music producer. It's not easy to place her original music, as she moves in conversation with composers as diverse as William Walton, Astor Piazzolla and Stephen Sondheim. in the most extended and memorable piece, Travelling to the Question, set for two female voices and viols, Green waltzes with that medieval mistress-nun of music, Hildegard von Bingen. Even more appealing is Green's arrangement of Italian composer Andrea Pandolfo's Albanese, a kind of modern-day barcarolle dedicated to "boatpeople everywhere". While losing the sparkle and verve of the originals, Green's arrangements of four miniature duets by Ross Edwards become new creations: not so the eternally fresh Eliza's Song by Elena Kats-Chernin, in which soprano Josie Ryan chirrups stratospherically. The voice seems on more comfortable ground in the music of those Elizabethan masters, Gibbons, Morley and Dowland. The darker hues of the low-voiced viols beckon exploration by contemporary composers, perhaps exploring plucked techniques to relieve a tendency towards aural monotony. The close-voicing and vibrato-free playing is a delight. This is an intriguing and beguiling companion for late-night listening.